AAC has developed rare earth based secur­ity pigments. The pigments are so called upcon­ver­sion phos­phors. If illu­min­ated with an IR laser of certain wavelength, two photons can be absorbed and re-emit­ted in one step, thus the re-emis­sion happens at shorter wavelength. 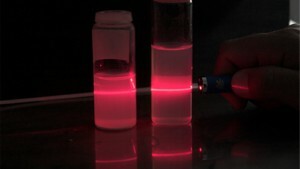 The IR laser is conver­ted into visible light, with a char­ac­ter­istic “finger print”, depend­ing on the compos­i­tion and doping of the rare earth mater­ial. By vari­ation of the doping, the finger print can be varied and customer-specific pigments can be synthes­ised. The pigments can be incor­por­ated into offset print­ing inks or also into ther­mo­plastic poly­mers. They are a unique and secure way, to invis­ibly mark products such as docu­ments, stamps, etc. Step 1 and 2 can be carried out with a simple IR laser pointer. Step 3 veri­fic­a­tion needs a VIS spec­tro­meter.